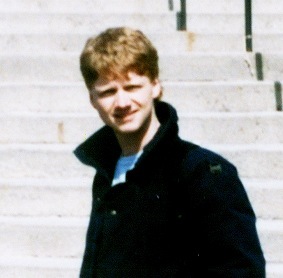 At the steps of the U – this was a friend’s coat… he liked mine and I liked his so we swapped. It’s 1985, I’m 23 years old and getting past a romantic breakup by exploring new avenues of creativity. I’d just purchased a recording Walkman and inherited an old reel to reel tape deck that recorded one stereo track at a time. So a friend and I began making experimental music and alternative soundscapes. We taped sounds from all over the place, later mixing them to music recorded at home. At one point we had a full drum set in the living room, three guitars, an electric piano, and anything else that squeaked, rattled or roared. My musical friends were always playing new records at home and at the radio station. And the university town had two good record stores. So we got by just fine without Spotify. The two 1985 tunes that stand out for me are The Cure’s “Kyoto Song,” which is sort of bleak and pessimistic. And The Waterboys’ “This is the Sea,” portraying the lighter side of hope and promise. Neither of these songs really speak to me today. I was young. Songs from the cradle, as it were. But looking back, they both chilled and thrilled me. I couldn’t have done one without the other. Hence, two tunes for ’85.